The death from a serious brain infection of a patient taking Biogen Idec's big-selling oral multiple sclerosis therapy Tecfidera has prompted an update to the drug's label in the US. The FDA issued a notice yesterday describing the case of a patient on Tecfidera (dimethyl fumarate) who developed progressive multifocal leukoencephalopathy (PML), the same condition that caused Biogen Idec's injectable MS therapy Tysabri (natalizumab) to be temporarily suspended from sale in 2005. PML is a rare and serious brain infection caused by the John Cunningham (JC) virus, which is harmless in most people but can cause PML in patients with weakened immune systems. News of the patient - who had been enrolled in clinical trials of Tecfidera and had been on the drug for more than four years - first emerged in October. "The patient who died was not taking any other drugs that affect the immune system or drugs that are thought to be associated with PML," said the FDA in a statement. "As a result, information describing this case of PML is being added to the Tecfidera drug label." Biogen Idec notes that the PML patient had been experiencing very low white blood cell counts, which is a known risk factor for the infection. The new labelling advises that lymphocyte counts should be monitored in patients and warns physicians to be mindful of the early symptoms of PML, such as weakness in the limbs or clumsiness and disturbances in cognition and memory. 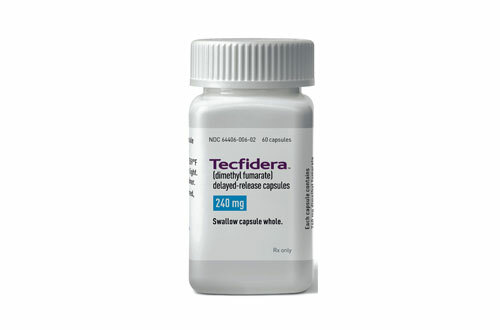 Tecfidera has been predicted to become the leading treatment for MS, as its oral formulation is more patient-friendly than earlier injectable drugs such as beta interferon. It generated sales of $787m in the third quarter of this year - actually a little shy of analyst expectations - and has been used to date in more than 100,000 MS patients. Biogen Idec said in its third-quarter results statement last month that Tecfidera is now the biggest-selling oral MS therapy - ahead of Novartis' Gilenya (fingolimod) and Sanofi's Aubagio (teriflunomide) - in the US as well as in Germany, which was one of the first EU markets for the product. The company told investors on the conference call that some loss of momentum for Tecfidera in the US - which accounted for $638m or more than 80% of total sales - was not unexpected. The roll-out in Europe and elsewhere in the world was only just getting underway however, and should help maintain a healthy growth rate for the product.